Carbondale was founded by William and Maurice Wurts. On March 15, 2019 the Carbondale Historical Society will celebrate the 168th anniversary of the incorporation of the City of Carbondale on March 15, 1851 with a festive Birthday Dinner/Celebration. All interested persons are cordially invited to attend. Details on the dinner/celebration on March 15, 2019 will be be posted here. Carbondale Historical Society and Museum, Inc. This is Matthew Levine, from The Carbondale Report, back after a long period of inactivity due to thesis obligations. The past month or so, I have been doing almost nothing but drafting, revising, and repeating the process. Now that I have a brief lull in thesis activity, I thought I would return to writing my columns for you. With that said, here is a look at some upcoming happenings! At this point in my thesis, I have essentially delved into partisan divides between two political parties in late seventeenth-century England: the Whigs and the Tories. As part of the process, I have analyzed and researched their approaches to anti-Catholicism, which united them both, but led to differences simultaneously. For example, while the Whigs were staunchly anti-Catholic (especially anti-French) and sought to unite all Protestants on their side, the Tories claimed that they were the truest supporters of the Church of England (Anglicanism) and that Dissenters (e.g., Presbyterians and Quakers) were conspiring with Catholics to weaken the Anglican Church. In utilizing this approach to my thesis, I have accomplished such objectives as tracing the rise of both parties in the 1670’s, writing how their ideas changed or stayed the same over time, and reading pamphlets from the perspectives of party supporters on either side of the coin. At this point, I cannot graduate in the spring because of conflicting obligations between my thesis committee and I, but I hope to do so in the summer. I can proudly call myself a Master’s student when the time comes. Now, to local happenings: After Easter, the Greater Carbondale YMCA is hosting two major events. The first is a Silent Auction that will be held at the Highlands in Archibald on Friday, May 3rd, at either 5 or 6 P.M. The second is the 25th Annual Fred Ciotti Memorial Race, which will occur on Saturday, May 11th, at 9:30 a.m., followed by a Healthy Kids’ Day program at 11:00 a.m. This will be a special race - it will be a Color Run that will feature the walkers/runners getting colored with blue dye in honor of Autism Awareness Month (although that is April, not May; also, blue is the color used to represent autism). We hope to see your faces at either or both of these events. The previous was both a recap and a snippet of upcoming happenings in the Pioneer City. Once again, please check out our next column for more exciting events and happenings in the Pioneer City! Carbondale, PA: Most probably this photograph was taken at the time of the Centennial Celebrations in Carbondale in 1951. This photograph of South Main Street was taken from Carbondale City Hall. There were two "Gravity" railroads in northeastern Pennsylvania in the nineteenth century: the Delaware and Hudson Canal Company's Gravity Railroad from Carbondale to Honesdale, and the Pennsylvania Coal Company's Gravity Railroad from Pittston to Hawley. The article given below is about the presentation that Dr. Powell gave on April 22nd at White Mills, PA, on the Pennsylvania Coal Company's Gravity Railroad. This talk, which was very well attended and very well received, was a part of the annual Tom Kennedy Local History Festival. Genealogical and/or historical research requests must be received by the Historical Society through one of the research request options offered under "Research Services." Genealogical and/or historical research requests that are sent to the Historical Society's email address can not be processed appropriately by the Society. For general research not related to genealogical items, select Research Option #6. 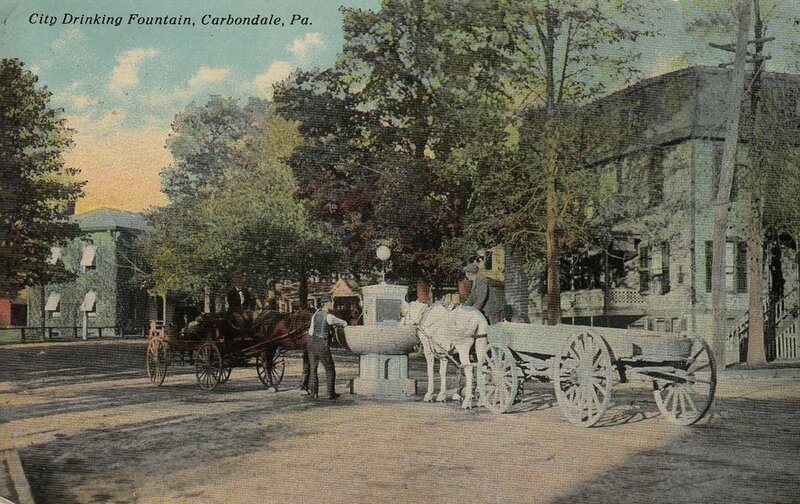 "City Drinking Fountain, Carbondale, Pa." This drinking fountain for horses was located in the center of the intersection of North Main Street and Lincoln Avenue. In 1951, the City of Carbondale celebrated the centennial of the incorporation of the City on March 15, 1851 with a week-long celebration, featuring several street parades, all with a wide variety of floats. In the photograph shown here, we see a D&H steam locomotive pulling a Gravity Railroad passenger coach down Main Street. 2018 Historical Society Membership Campaign: To renew your membership in the Society for 2018, click on "Membership" at the head of the webpage. Select the level of membership that you wish to register for, and fill out the membership form there. To continue to do all that we do for the community, we need the membership support of many people. Please help to continue our work on behalf of Carbondale's past, present and future. Mason Jars: Among the many remarkable items in the holdings of the Historical Society are many home canning jars from the nineteenth and twentieth centuries, including some remarkable green jars from the mid-nineteenth century. These jars have all come from houses in the Carbondale area. Historical Society and Museum on the third floor of Carbondale City Hall. Photography Studio on Main Street? The Elite at the Park? on this sunny day, the sidewalks were empty. hometown for college and to establish careers. Carbondale Historical Society? What about the residents of Carbondale? 2016 members. Please see below. those of us who are non-residents as well. Society's webpage: www.carbondalepahistorical.org. Click on "Membership"
Welcome to the new and improved Carbondale Historical Society website! Please bear with us as we migrate to the 21st Century and update this site with all of our archived content from our old site as well as provide new content for you to enjoy. The Carbondale Historical Society and Museum is located on the third floor ofhistoric Carbondale City Hall and Courthouse in Carbondale, PA. The building, which is listed in the National Register of Historic Places, is located at One North Main Street. The first public meeting of the Historical Society, founded in October of 1974 by a group of six Carbondale Area school teachers, was held in January of 1975. On November 6, 1982, the Historical Society and the Committee to Restore Carbondale City Hall merged to form the Carbondale Historical Society and Museum, which was incorporated on March 15, 1983. The Carbondale Historical Society and Museum is an educational and historical membership organization whose mission is to record, gather, and preserve the history of the city of Carbondale and the surrounding area. Through its genealogical and local history research center and exhibition galleries on the third floor of Carbondale City hall (listed in the National Register of Historic Places on January 6, 1983, through the efforts of the Society) and through an annual series of public lectures, programs, exhibitions, and commemorative ceremonies, in the community and in the public schools, the Society, at the same time, interprets and makes accessible to the public the City's rich, diverse, and unique history and heritage. The Carbondale Historical Society and Museum is committed to the central values of (1) maintaining the highest possible standards in all its endeavors, (2) providing excellent service to the public at all times, and (3) demonstrating leadership and innovation in the field of local history. The Society's research room and exhibition galleries are open from 1 - 5 P.M., Monday through Friday, and by appointment. Given the fact that we are an all-volunteer organization, it is always a good idea to phone ahead (570-282-0385 or email srp18407@gmail.com) to make sure that someone will be at the Society when you arrive. This is especially important if you're traveling from out of town to Carbondale to do research.